As I already told in my previous post, I registered again in the APEX forum. After one week and having posted 60 answers it's time for my first "wrap-up". My goal is to put some links to the forum that took my attention. Sometimes these posts made me laugh, sometimes they made me cry and some of them I found really interesting. - Deploying APEX through an .exe/.bat file: When you don't know Oracle, this is a normal question I think... Some people start using Oracle XE and make some APEX applications. Then they want to give it to their customers/friends/... In VB for ex. you would make an exe file, but APEX is different. How do you get your app via a cd to somebody else? Not easy... that would be an enhancements request. "Oracle XE 11g-to-go"? It would be cool to have: Unzip, make your app, rezip - done with packaging! - DBMS_SQL_INJECTION_ANALYZER: It's not released (yet) and I couldn't find anything relevant on google, but it would be a nice to have; checking if your App is secure. - SSO and LDAP: different authentication methods... also smartcard! I decided to start posting in the forums more often again. As I didn't want to loose all my posts for the "X-ed" time, I created a new login with an email I'll normally never loose (my Apex Evangelists one). Did you know you can't change your email address in the OTN forums? Maybe that's not a real problem, as you can still login into the forums, even when you don't have the email address anymore. The only thing you lose is getting a message when somebody replies to your thread. But even for that a workaround is available (watch user). Nevertheless, I decided to start from scratch, as I found it more clean. Jan 10, 2001: My first (?I thought of having another account from the year 2000, but couldn't find it?) login in the OTN Forums, at that time I was working at Oracle as a consultant. I posted 33 messages with the user dgielis. Oct 1, 2003: My first APEX question in the forums, at that time I used HTML DB 1.4 on an 9iR2 DB. 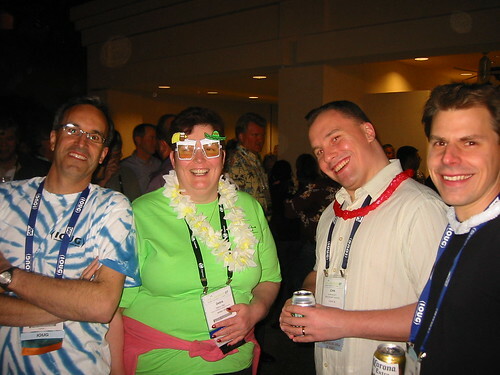 Feb 14, 2005: My second user dgielis_ in the OTN forums. I posted 78 messages with this user. Nov 13, 2006: My third user dgielis__ in the OTN forums. I posted 17 messages with this user. 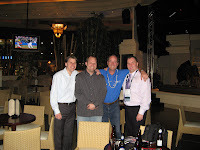 With the APEX SIG we talked about mining the forum... To get it started, I'll try to do every week a post with the funniest/most interesting topics of the APEX forum in which I participated. After a great week with a lot of highlights, I'm heading back to Belgium. But this conference was extra special for me, as I did my first presentation at such a big event. I have already been in the APEX round table panel at Oracle Open World, but presenting alone is different. 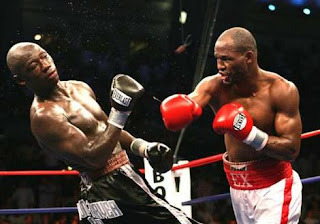 I must say I really enjoyed it, one of the highlights in my life. At this conference I also participated in three other sessions: the APEX SIG meeting, the round table conversation and the APEX hands-on lab. 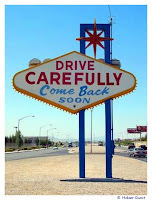 Of course you can also go to the pool or walk down the strip, but last week the weather wasn't that good to really enjoy it. I definitely want to go back at a time, but not yet in the coming years. Next year, Collaborate 08 will be in Denver. I've never been there, so I look forward to see that place, but first Daytona Beach! Thank you Collaborate 07 and Las Vegas! I found it a really interesting and great experience. I didn't sleep that well Wednesday night... I kept thinking about the presentation I had to do... I suppose doing your first presentation in the States or on a big conference makes it special. Finally it was my turn! 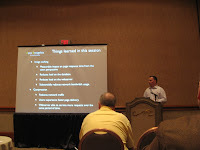 My presentation, as it got announced on the IOUG website a long time ago, about APEX Shared Components. History... If you're a regular reader of this blog you know the creation of the whitepaper and presentation took me a lot of energy and time... The whitepaper counts 56 pages, the initial presentation 116 pages, but I reduced it to 107 during this week. I started with presenting myself, knowing the audience and the goals of my presentation. Afterwards some people congratulated me, they said it was awesome (that was a word I often used during my presentation, as APEX is awesome ;-))... people saying that, gave me a warm feeling. I did my best... my English is not perfect, but I got the message to them. I hope they all enjoyed it. I took the image on the right a few minutes before I started my presentation. When the door closed, I think there were around 50 people. Thank you all for rising up so early (my session was at 8:30). The very last session of Collaborate was about the choice of (Oracle) tool for the future. This was the second time we did a session with the APEX SIG. 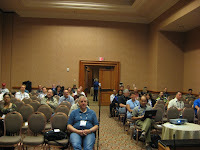 Where the first one was more about the APEX SIG itself, this session was very technical. 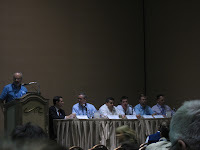 Steve Howard was the moderator, John, Tony, Carl and myself were in the panel. We had around 25 people who participated in this Q&A / round table conversation. One of the questions Steve asked at the other members of the panel: "What are your best new features in APEX 3.0?" In short, our answers: Tony likes the new charts and pdf possibilities, John likes, apart from the pdf and charts possibilities, the page and region caching and the improvements under the APEX hood. I went for the little Shared Components icon on the top right hand-side in Application Builder, improved Supporting Objects and the new drag and drop lay-out. Then we did a round tour to know which people already had production APEX applications and what they are used for. It was really interesting to hear all these different usages of APEX. More about these "references" will be published on the APEX SIG website. After that the people in the room started to shoot questions at us. One of the questions was about a problem with Flash Charts in APEX 3.0. I took my laptop and quickly tried to reproduce it, and indeed... printing (or print preview) a Pie Flash Chart in Firefox doesn't work! Definitely something we should investigate. The feedback of the session was really good, people likes us to do these kind of round table conversations. We already saw it at Oracle Open World and it got confirmed again at Collaborate 07. You always forget the syntax of the APEX url, or you ask yourself: "What was it again... :APP_ITEM, &APP_ITEM., the v notation?". Karen did an overview when you should use what syntax. She also gave some APEX Tips and Tricks. This session was all about PLSQL cursors, packages etc. 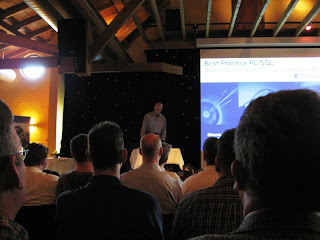 John Flack also talked about the PLSQL web toolkit (PLSQL Server Pages) he used. It's a pity that he doesn't know (or doesn't use) APEX, as a lot of the things he does manually, are already done for you in APEX. Nevertheless I think it was a good session for starting PLSQL developers as John gave some tips working with cursors/packages and also stressed the importance of using for ex. bind variables. 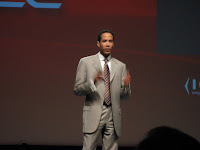 I first saw Tony presenting at OOW 2006. Tony is a board member of IOUG and is involved in a lot of others. You see he presented before, he talks calm and easy and makes sure the people in the audience knew the topic. 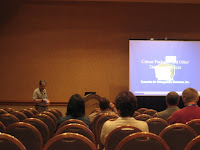 This session covered all the possibilities you have using the standard email functionality in APEX. He showed the apex_send (htmldb_send) package, how you could keep track of mails, when they exactly are sent and where you can find the logs of the sent messages. After having had a short night, the second day of sessions started. I really like to see Rich presenting and again it was a really good session, although I have to say that I think this was one of his most challenging ones! He got a lot of questions and because he didn't investigate everything yet (the product is still in beta), he didn't know all the answers! But hey, who knows everything?! 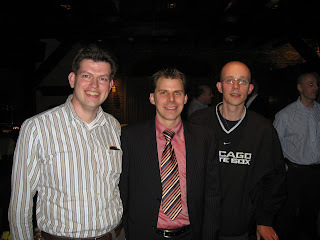 But I had the impression that some people expect sometimes "everything" from somebody as famous as Rich Niemiec. 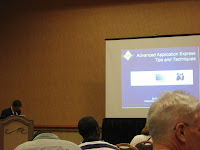 This session described a part of an APEX project she did. She explained some of the nicest features she had used to accomplish her goals. The first public AE presentation at Collaborate 07. I liked Johns session. It was an advanced session with in debt knowledge how you can achieve better performance in APEX applications by using two different methods: Caching and Compression. For the caching he showed an application which handles an upload of a picture. The first application shows the image without Expiry date, the other one, with an Expiry header. The performance gain is enormous. I suppose John will blog about it himself, or you can have a look at his whitepaper how you can do and test it yourself. That was also something I liked in his presentation, everything he did you can do it yourself. All steps were clear and well detailed (especially in the whitepaper). I also use Image Caching in DG Tournament (and previous WC 2006). Remember when my app first got announced on Tom Kytes Blog? That time we got 10.000 hits an hour and saw the bandwidth increasing enormously, then I implemented this caching and saw the difference! The compression can be done trough mod_gzip (or others). In the presentation he explained the mod_gzip implementation and what you would gain when using it. Impressive really, and I'm happy that Shellprompt/APEX Evangelists is using this technique for all the hosted applications. 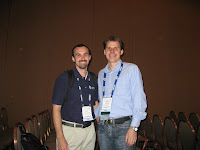 Steve Howard, President of the IOUG APEX SIG, presented the direction we will take with the APEX SIG. You can expect some new things in the near future: a new website, blog mining, newsletter, .... More will be announced on the IOUG APEX SIG website. We also discussed what our SIG should be doing and one of the things from the public was that we should consolidate the "new feature request" or "most annoying things" or "bugs list" etc. So you may expect something in that direction too. We also need all APEX developers (you!) to help us out with this SIG, as at the end it's each of us (or the members of the SIG) who makes it happen. This session was a brief intro into BI Publisher. He showed some basic functions of BI Pub and what his experiences were when he first implemented it. After OOW APEX Meet-up, we held our second APEX Meet-up, and again I found it really enjoying meeting some other APEX lovers away of the session rooms. We had some nice chats about APEX, live and Las Vegas. Thanks guys for the lovely evening! As I got a lot of reactions on a picture I took at OOW (me and a nice looking lady), I thought to do it again... the result... this is how you get served when you order something in the Luxor hotel! On Monday a lot others arrived and the queues were a lot longer. 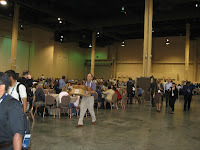 The number of people at Mandalay Bay are impressive, especially for the keynote speeches! The halls were too small! 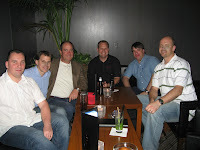 This Collaborate is in memory of Stan Yellot, one of the first members of IOUG and the driving power behind this Oracle User Group. 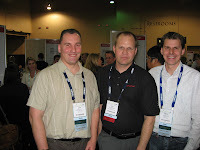 Ari also said IOUG is all about collaborating (participating / knowledge sharing / ...). We all participate and help each other (for free) as we are all passionate about our work. I also like these seminars because it's a great place to meet the people you never see, but talk a lot to on the internet. 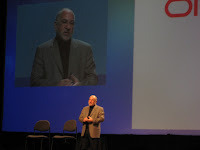 Another big part of the keynote was about thirty years of the Oracle database, which was presented by Ken Jacobs. 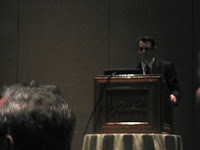 It was my first time to see Ken Jacobs (aka Dr. DBA) presenting and I liked it a lot. He showed a bit of the history were Oracle came from and were it goes to. Together with some other Oracle people he also showed some new features in 11g. I can still remember they talked and demoed about Data Vault, Audit Vault, Information Lifecycle Management (made in APEX! ), new partitioning methods, ... This keynote was recorded, so it should be available soon. 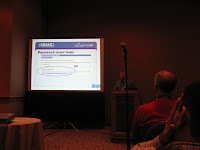 This session was about some of the features in the database you get free of charge, like for ex. DMBS_XPLAN, tkprof, SQL Trace, Trace Analyser etc. Dan also made some tools around these Oracle tools to get a better visual (UI in Java). At the end he also demonstrated some basics of SQL Developer. I would have thought he would have spent some time on APEX, as that's free too, but he didn't. So after all I was a bit disappointed. This was a pretty good session, but he had to go quickly over his presentation as it was a bit too much to cover indebt. Bradly is also one of the autors of the HTMLDB-book. He referenced a lot to the forum, so this session gave you an overview, but the actual code you should look for further down (in your own time). I can understand him, I've also a lot of material to cover in my presentation, so fitting everything into a one hour presentation is not that easy. Also the mix of the public makes it hard as some are starters where as others are very experienced. This session was al about Dynamic SQL: Execute immediate, Dynamic Cursors, DBMS_SQL, bulk operations, functions returning collections etc. There were a lot of good insights in dynamic sql. Michael also mentioned the pitfalls, which I found really good. Not everybody goes and look at asktom how to do something in the best way possible, so mentioning to use bind variables for ex. is really important! Also when using dynamic sql, be careful with bad implementation so that "Sql injection" doesn't become possible. Michael gave some of his techniques to overcome this. This was a bit like some of the rumours predicted on certain blogs. Charles Philips also came back on 30 years Oracle and announced something new called "Project X" - "an important development initiative that has been underway to unify our broad portfolio of applications and help customers close the gap between evolving business needs and IT's ability to execute." I'm more into Oracle technology, not that much in "Oracle Applications", although I recently looked into Oracle Siebel CRM which I find really nice. Nevertheless this Project X is into that direction, letting all those Oracle apps or the apps Oracle bought over the last years, work together and integrated (hey BPEL!). I think this was the "logic" step that Oracle announced. I found Charles presenting very well (although he moved a lot on the stage, apparently he can't stand still ;-)). In the evening the exhibition hall opened. A lot of companies have a stand over there. They look all very nice. Most of them offer you something to drink or a gadget. As we're an Vegas, you can also win something by playing with them (Everything is allowed to attract the attention of the people I suppose). Later that night I arrived back in my hotel room and started answering mails and did some other urgent things from clients. I find it really hard... Collab can be really intense, because following these sessions and meeting all these nice people is awesome, but it also makes you tired. But if I finally want to go to bed, in Belgium they start working again (Belgium is 9h ahead compared to Las Vegas). So I don't sleep that much at the moment. 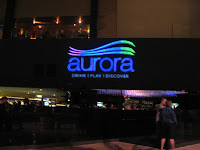 We will hold our APEX-meetup on Tuesday at 19h30 in the bar of the Luxor hotel in front of the registration desk. Hope to see you there my fellow Collaborate attendees! There were some sessions of Oracle Education on Sunday, but I didn't follow them. It were 8h presentations and hands-on on specific topics. In the morning I did my registration. I was lucky as there wasn't a queu to register yet. I also heard that there wouldn't come 6.000 people to this conference... but 7.000! It's not yet comparable to OOW, but it's getting nevertheless a big event. We got a badge and a bag with some papers (schedules and ads) in. As a speaker I also got a special blue/white t-shirt. I also searched for the "Speakers Ready Room", a room where all speakers can (need to) go to, to test the beamer (and connection with laptop) and sign up for presence. It's my first time as a speaker on a conference, so it's all a bit new to me. I also met some other speakers, had a chat with some of them and walked around to get to know the locations of the different rooms. The Mandalay Bay hotel is so big! The Collaborate event covers two floors with rooms and an exhibition hall. In the late afternoon I had two sessions for speakers. One because I'm new: some tips and techniques to present, the other one with some practical info. After these sessions there was a special SIG drink. Every SIG had 5 minutes to present themselves. Steve Howard, President of the APEX SIG, spoke for our SIG. In the evenings there were some other welcome receptions with food and drinks... I didn't stay that long as I became tired. So that ended my Sunday. I didn't gamble yet, but before I leave I must have tried it! The weather is fine, but I thought it would be better. A week ago it was over 30 degrees, where it's now only 24 with a lot of wind. Yesterday I met up with John. We had a lovely evening with some nice food in the hotel. 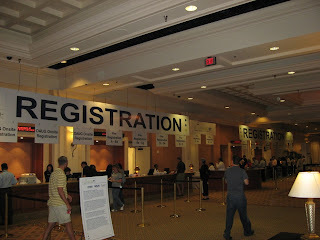 Today I'll register for Collaborate, a day before the 6000 others. 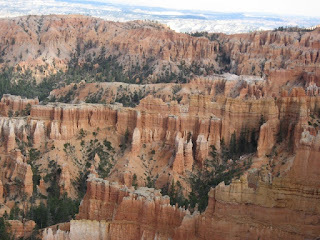 During the last week I did a little trip through Nevada, Arizona and Utah. 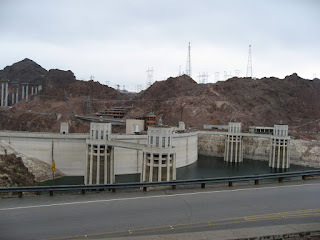 I saw Bryce Canyon, Lake Powell, Glenn Canyon Dam, the Grand Canyon, Route 66 and Hoverdam. I was really impressed by all that! 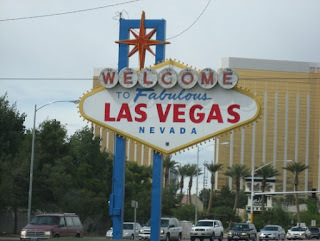 Tomorrow morning I'll leave for Collaborate 07 in Las Vegas. The first days I won't be online so often, but as soon as the conference starts, you may expect daily reports! Doing my presentation about Shared Components will be a challenge! There are so many different Shared Components in APEX! To fit all that in one hour, will be impossible, but I'll try. Some of them are already well known, so I'll go really fast on these ones, as for others I'll do real demos. Well, it can happen... You use so many different passwords that you forget one of them. That should have fixed your problem. Try again to login into APEX. Yesterday evening I went to the Steven Feuerstein (aka PL/SQL Evangelist) event, organized by Ordina and Quest Software, in the Netherlands. It took me a while to get there (as I come from Belgium), but it was worth it! I've already seen Steven presenting a few times and I always liked it soooo much! The energy, the flair, the jokes, the charisma, really nice! I'll start with some feedback about the presentation itself, titled: "Best Practice PL/SQL - Ideas for writing the best PL/SQL code of your life". As an "APEX Evangelist", I can agree with almost all of them! But I don't really agree with statement 3. If I can write something with SQL I'll do it, I don't use PL/SQL until I really need to... but I don't think that was really his point. He gave some arguments to stop writing so much SQL, as he states: "SQL are always hard-codings", so he prefers table APIs. After the presentation I had a quick chat about that with him, you'll see some more about that in the next weeks. Another part of the presentation was about the Quest Code Tester for Oracle. I also find testing software really necessary (but also a pain in the a**) This tool should help you with it. This event was also an opportunity to meet some of my Dutch colleagues. I not only met some nice Ordina NL people, but also some online (virtual) friends and bloggers. 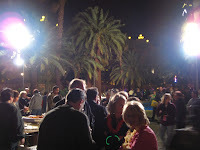 I had my camera with me, so here are some pictures of the friends I met at the event. On the picture you see Jornica (left), me (middle) and Patrick Barel (right). 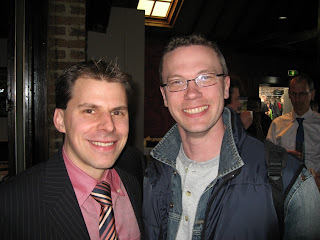 The right picture is of Alex Nuijten of AMIS and me. Nice to meet you guys! Thanks for the wonderful evening. 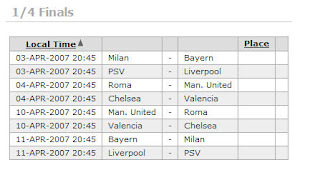 The UEFA Champions League starts again tonight! I added the schedule of the Quarter final in DG Tournament. So, you can start betting now! We shall not use APEX!? 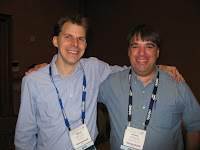 During the weekend John Scott and I were discussing an article on Chris Muir's blog. John commented on the article and posted his opinion on his blog (Carl Backstrom and Scott Spendolini posted also a very nice comment). 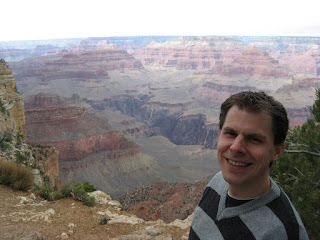 I also added a comment to Chris' post and promised to go into more detail on my blog soon. 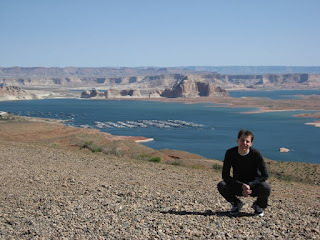 Chris' article "A career path for Oracle developers - consider JDeveloper!" is about the choice for JDeveloper as *the* tool for next generation Oracle development. Do I share Chris' opinion? No. I believe in all Oracle tools but IF I had to go to a deserted island with only one Oracle tool, I would choose the Oracle Database (as I get APEX free of charge with it ;-))! If one tool was best for everything, Oracle wouldn't have more tools... I strongly believe that APEX can do most of the development and is a true solution for most of the business problems of today. I also believe JDeveloper is a great tool and ADF has its place in this world too. 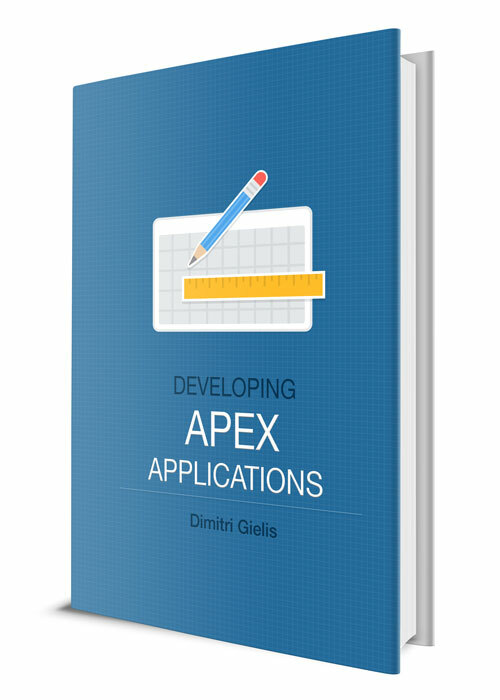 In my APEX projects I use also other tools like SQL Developer and JDeveloper! I really like the ERD, UML and PL/SQL-tools in JDeveloper. Last week I read this article (in Dutch). That company did an internal competition: 4 teams, each team uses his favourite technology. They got one day and a half to develop a business case with as much functionalities as possible (in the time frame of that 1,5 day). 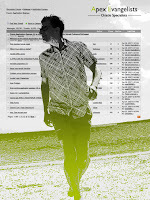 find the most suited tool to do RAD (Rapid Application Development). Oracle Designer, Oracle JDeveloper (with ADF), Adobe Flex Builder and APEX. 80 business rules to implement from webservices, lovs, printing of pdf documents, authentication, calculation of positions etc. The jury was impressed by their application, as they asked how much time they still need to make it a full application ;-) They got almost all back-end done and I can imagine that the front-end was nice and slick. This is a new tool of Adobe (I also did some testing with it, as you find in some other posts on this blog). It's a nice tool, but these guys made such a complex architecture that they couldn't get the prototype finished. So they retreated out of competition, but showed what it could do. The jury was unanimous on this: APEX won the match, but the jury added that changing the templates to a custom lay-out would take some time, which would compensate some of the time they were ahead of the others. So, shall we *not* use APEX? Hell no!! The people reading this blog more often know I'm a big fan of Oracle and APEX.